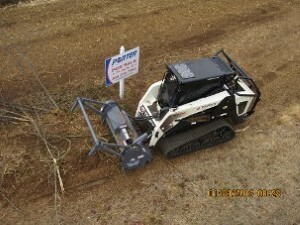 At some point while building on your land you may run into the need for Varina Land Grading. In fact you may already know this is something that is part of an upcoming project you have. However, you may not already know what it is or why it is so important. Grading land means cutting dirt from an elevated spot and filling in a lower spot. The process levels out the area making it flat and even, which is why it may also be referred to as leveling. If you have ever seen flour leveled off in a measuring cup the idea is similar, except the cut off extra often goes to fill in lower spots nearby. Where it becomes so important is how even it is. For instance, if you are grading in order to build a structure on top of the dirt you need it to be even. If it is not then the structure's foundation will never be truly flat or straight. Over time this unevenness will become more prominent until the floor will actually start to shift, which cal also impact the walls and roofing. This can result in the need to employ very expensive methods to correct or to raze the entire building and rebuild. But there is even more to it than that. Take grading for a drainage ditch for example, or leveling dirt near an already existing structure. If this is not done professionally and with the utmost precision, it can have disastrous results because it can actually end up sending rain or other water towards the foundation of the home, instead of away. In addition to problems like mold and mildew, you will also notice issues that can eventually lead to the decay and collapse of the foundation and overall structure. So it only makes sense to make sure the job is done correctly right from the start. To get started, you really need to have the right crew on your side. A job like this needs to only be taken care of by the most reputable of professionals. At C.S. Flournoy we know what it takes to get the job done, right. Our team has the training, experience and skills to take care of this important task with the utmost precision. For over 30 years now C.S. Flournoy has been the team to call on for this and many other tree care service related tasks. We look forward to showing you in person how our dedication to hard work made our Richmond Tree Removal Company the number one choice in the area. If you are looking for Land Grading in Varina then please call 804-264-1000 or complete our online request form.